Watch out for a number of layouts from me on the weekend. I'm putting the pressure on myself as I'll be home alone all day! 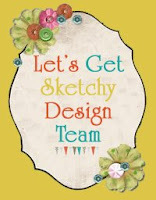 Let's Get Sketchy First Official Challenge!